Drain the water of the cooked pasta but keep in the cooking pot. Beat the eggs and milk together and season to taste. Add the egg and milk mixture to the warm pasta, mix through and cook together for one minute. Add the ham and the baby tomatoes. Serve as a complete meal. 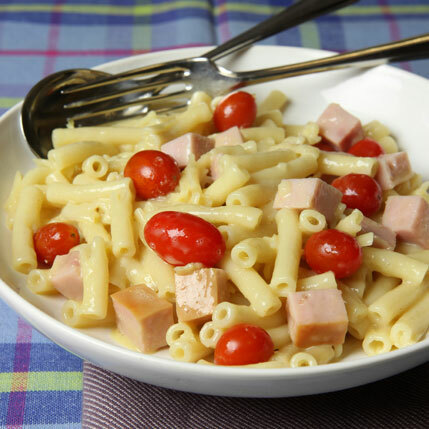 Baby tomatoes can be cooked in a warm, oiled pan before adding to pasta.